Don L. Allen, D.D.S., former dean of the University of Florida College of Dentistry, passed away on June 22, 2018. He joined the college in its fledgling years, serving as interim dean from June 1973 to September 1974, and as dean from September 1974 to October 1982. During that time, he oversaw the move of UFCD, which had been operating in several temporary locations, into the dental tower. He was here when we began providing care to our first patients and presided over the commencement of our first graduating class of 24 dentists in 1976. He also ushered in the establishment of advanced education programs and the continuing dental education program, which began in 1981. 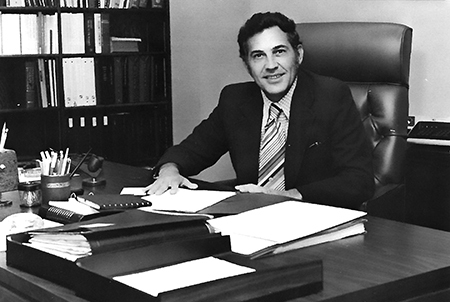 After leaving UF, he served as dean of the University of Texas School of Dentistry. Allen received his undergraduate diploma from Elon College. He earned his dental degree at the University of North Carolina School of Dentistry followed by a master’s in periodontics from the University of Michigan. He spent his postgraduate years in dental education, becoming the dean of the University of Florida College of Dentistry and then the University of Texas School of Dentistry. He was the president of the International College of Dentists in 1982. Allen was born and raised in Burlington, North Carolina. He is predeceased by the love of his life Winnie Allen, his wife of 55 years, and Margaret Allen Small, his sister. He has three children, Don L. Allen, Jr., and wife Lisa; Michael D. Allen and wife Ginger; Susan Allen Bossley and husband Clinton. He also has five grandchildren, Catherine, Sarah, Elizabeth, Tyler, Hannah and one great-granddaughter Charlee. A private memorial was held at Crescent Beach which was his favorite place to spend time with family.